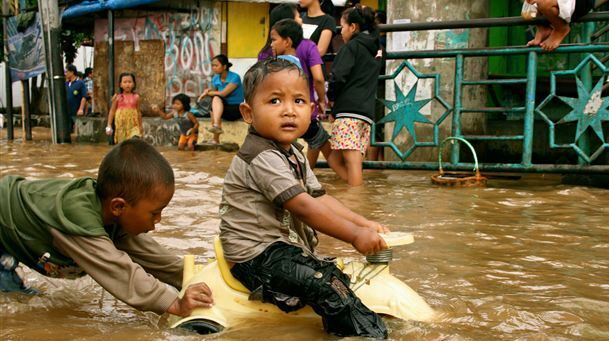 Governor Jokowi launches state of emergency and an appeal to raise funds for flood victims. The toll is 11 dead and thousands displaced. Rice, water and basic necessities sent from archdiocese of the capital, which operates as a center for collecting and sorting. Faithful respond "enthusiastically" to the call by the priests. Jakarta (AsiaNews) - Indonesian Catholics are responding to appeals from the civil authorities in Jakarta, with a collection of goods and basic necessities for the displaced due to heavy floods in the capital (see AsiaNews 17/01 / 13 Jakarta paralysed by heavy flooding and traffic congestion). Yesterday, the governor Joko "Jokowi" Widodo declared a "state of emergency", launching a formal request for aid; a quarter of the capital is flooded and, according to local sources, the wall of water in some places has reached four meters high. The toll so far is 11 dead, with tens of thousands of people left homeless. The areas most affected is ​​Kampung Melayu, East Jakarta, crossed by the river Ciliwung, which burst its banks and is one of the main causes of flooding. Many voluntary groups, activist organizations and ordinary citizens, including Catholics have responded to the appeal launched by the authorities. In the Kampung Melayu, the parish of St. Anthony in Bidara Cina opened its doors to people of all religions, hosting many refugees and offering them shelter. The Church initiative was joined by different groups of the faithful who have managed to collect food, drinking water and items for personal hygiene. In Indonesia, the most populous Muslim country in the world, Catholics are a small minority of about 7 million people, equivalent to 3% of the total population. In the Archdiocese of Jakarta, the faithful amount to 3.6% of the population. The constitution provides for freedom of religion, but the community is often the victim of acts of violence and abuse, especially in areas where an extremist view of Islam is more entrenched, as in Aceh. However, as in this instance, they are an active part in society and contribute to the development of the nation or aid work during emergencies. Among the many examples of solidarity is an initiative launched by Catholic lay woman Theresa Rita, from parish of St. Joseph in Matraman, who responded "enthusiastically" to the call of the priests of the capital. Using smartphones and social networks, the woman set up a mailing list, sending out an appeal for the collection of so-called " nasi bungkus", small bags containing rice and water. The generosity of the people has resulted in thousands of these small parcels, even from other dioceses of the archipelago. In Bogor, in fact, a fundraiser was held sponsored by Suparman Surjadi and his wife Linda Nurtjahja, a doctor by profession, and Ingrid Barata, among all the faithful of the parish of St. Francis Xavier. "We immediately received millions in donations," Surjadi told AsiaNews "sent by many Catholics who wished to support our mission." The goods collected are allocated to the committee for social activities of the Archdiocese of Jakarta, which acts as a clearinghouse. The Bishops' Conference of Indonesia (KWI) also actively contributes to the aid work, to alleviate the suffering of the people in the capital paralyzed by floods.